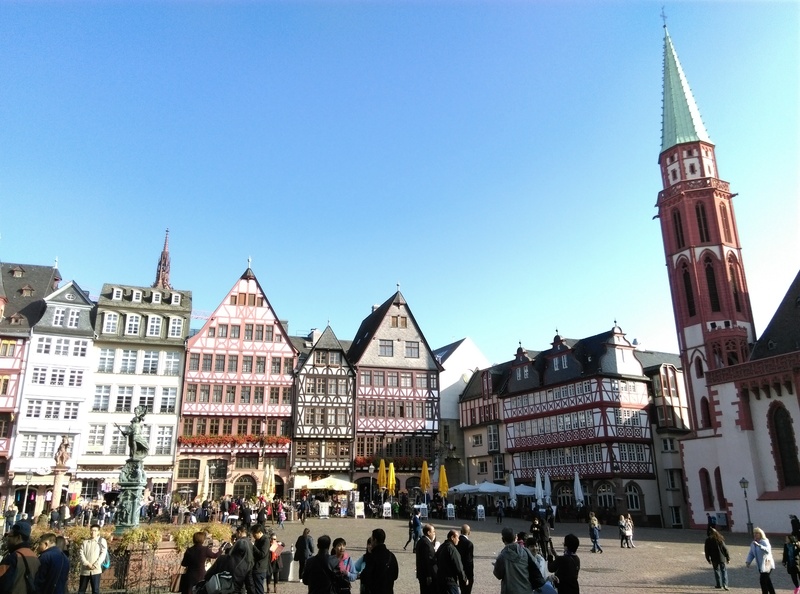 Frankfurt might be better known as a business hub than a tourist hotspot, so not many travelers visit this city, unless they are on a business trip. 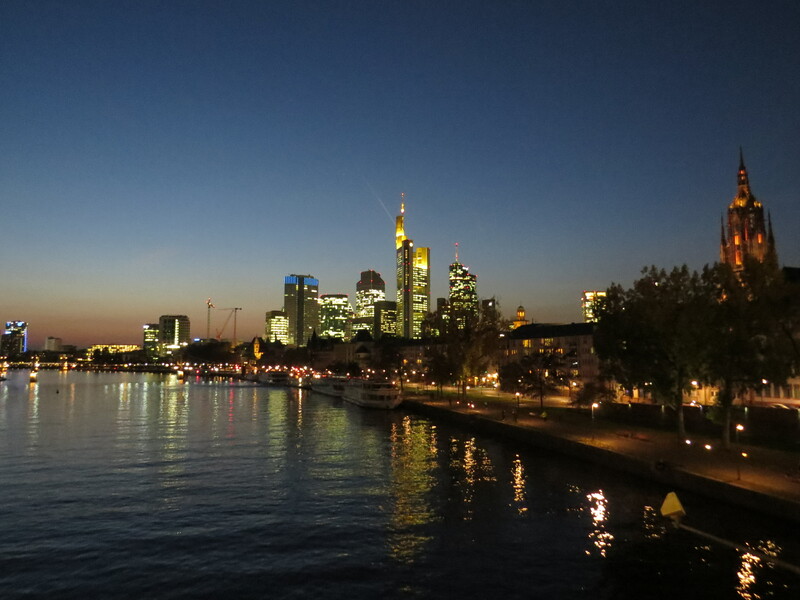 For me, I was flying back to Taiwan from Frankfurt at the end of my Europe trip so I had to visit Frankfurt. And it wasn’t bad at all. The city, where Germany’s financial sector and stock market are based, has a good modern skyline, one of Europe’s best, located next to the Main river, and the Römerberg, the historic old town center where the Römer, a medieval complex that has been Frankfurt’s City Hall for over 600 years, and several reconstructed, picturesque old houses are located. The reason they were reconstructed is that the original ones were destroyed during World War II. 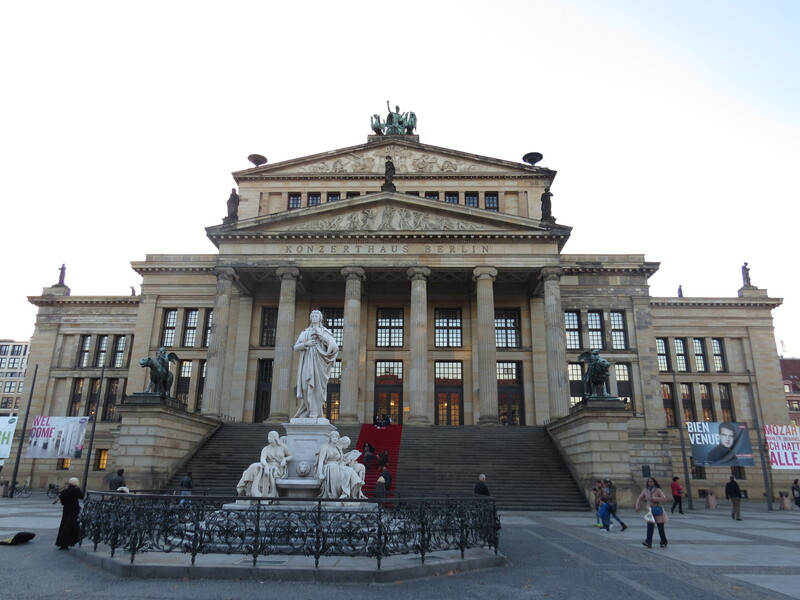 The Römerberg was undergoing renovation when I was there, so the appearance may have changed now. 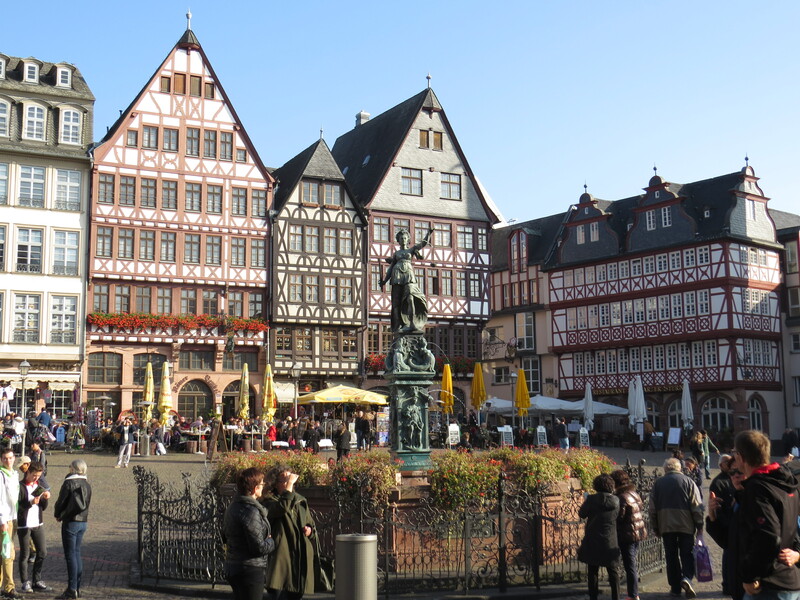 With over 1,200 years of history and being a major city in the Holy Roman Empire starting from the 9th century AD, Frankfurt has been important for a very long time. In the present, as Germany’s financial center, as well as the European Union’s, Frankfurt has one of the most numerous collection of skyscrapers in Europe, including the EU’s second and third highest skyscrapers. However these were modest compared to Asia. European cities don’t seem to have too many skyscrapers and the ones they have are not too high. I wonder if this is because of disdain for ultra-tall buildings, a lack of need, or simply building regulations. Anyhow, I liked that European cities didn’t feel crowded or cramped and were very walkable and pleasant. 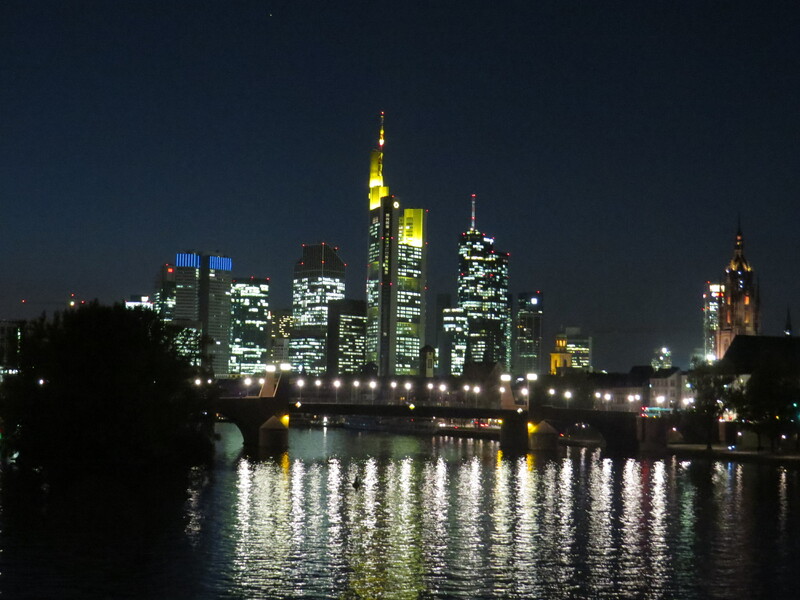 Frankfurt was no different. 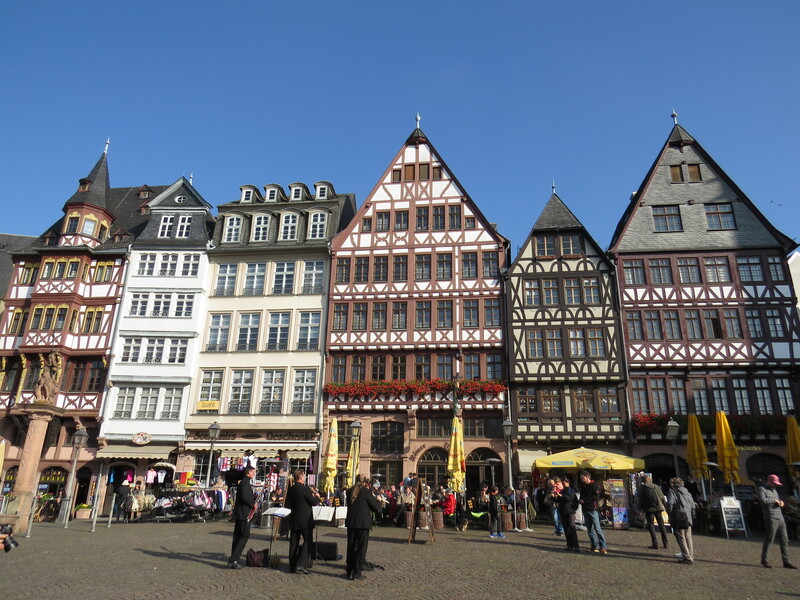 As with most major European cities, Frankfurt has a large cathedral as well as a pedestrian shopping street that was still busy on an early weekday night. 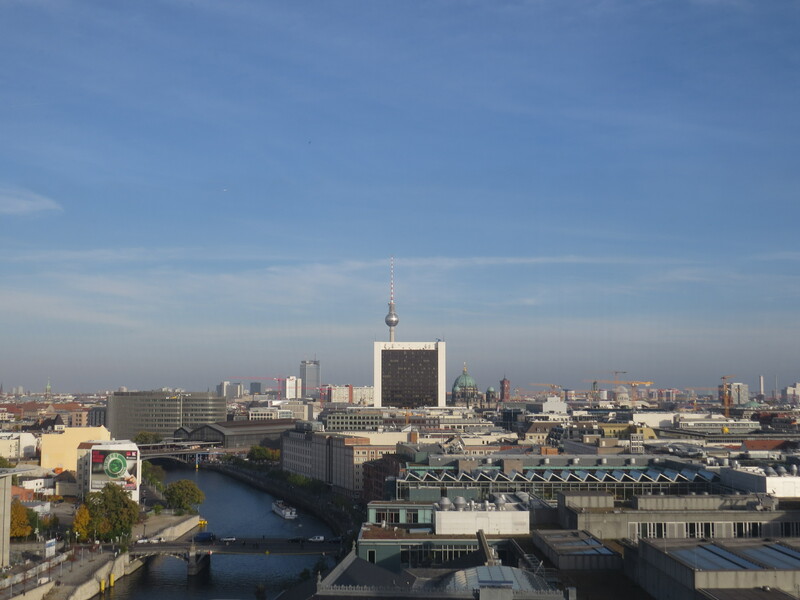 The cathedral (technically not a cathedral but it is still called one since it was used for the election and coronation of Holy Roman Emperors) is not that large, but you can pay to climb up the tower for sweeping views of the city and river. I also visited a couple of the city’s major cultural attractions. The great German writer Johanne Wolfganng Goethe was from Frankfurt, and his childhood home is now a museum, an elegant house where the rooms are well preserved and personal belongings show visitors how Goethe grew up (a book about Italy given by his father helped inspired a fondness for Italy and travel for Goethe, who would later visit Italy himself). 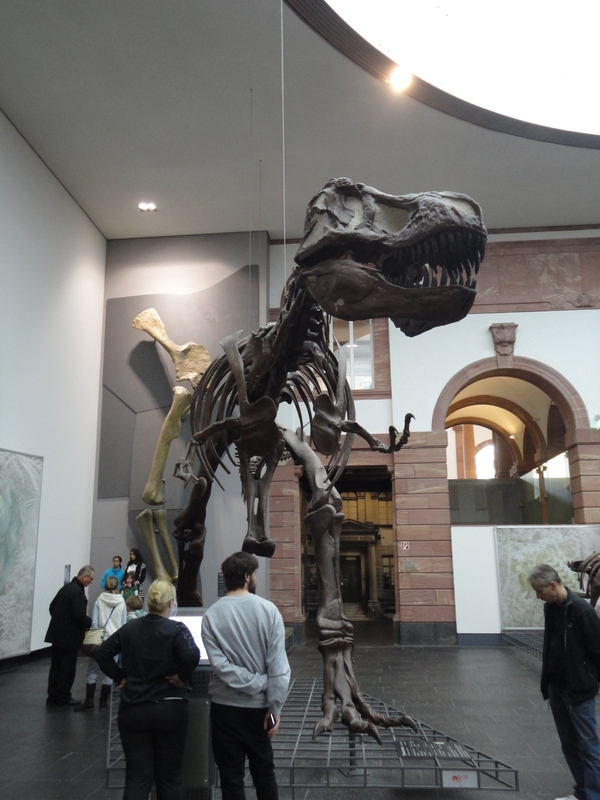 The Senckenberg Natural History Museum features great collections of fossils and stuffed animals, but the highlight was the numerous dinosaur and mammoth skeletons including the tyrannousarus rex and marine shark-like dinosaurs. 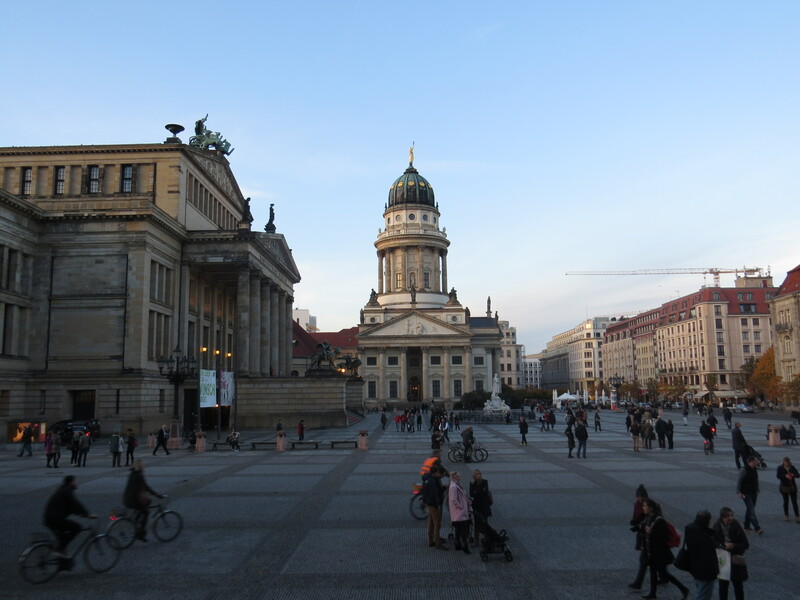 I stayed near the main train station or Hauptbahnhof, in a supposedly rough part of town, but it was very convenient for getting around as well as to the airport, less than 20 minutes away on the subway. 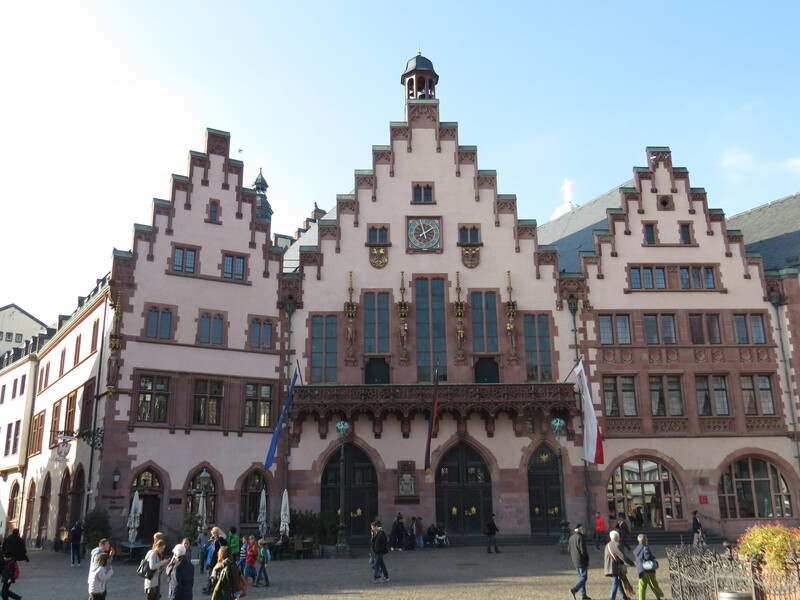 If you find yourself in Germany and want to try a new city, give Frankfurt a chance. The skyscraper with the strange side spire, the Commerzbank Tower, is Germany’s tallest building and the second-tallest in the EU. 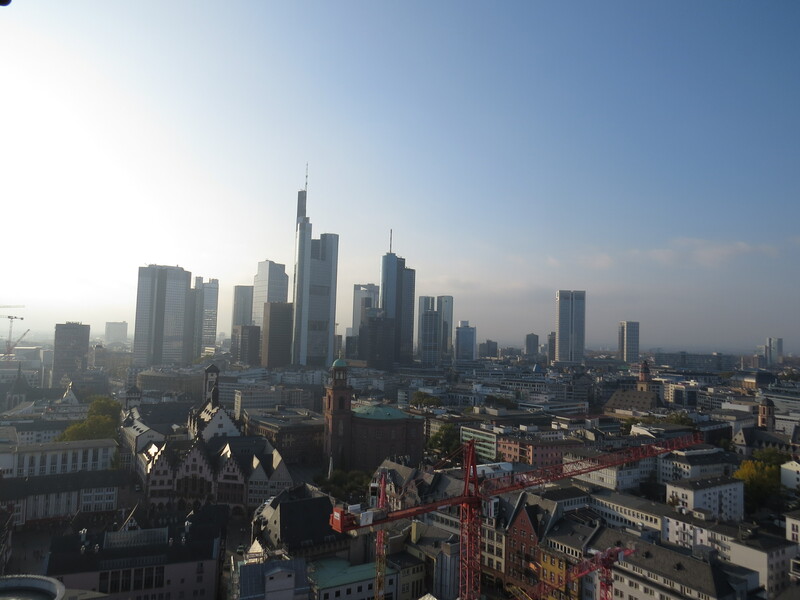 At right, you can see the Frankfurt Cathedral. 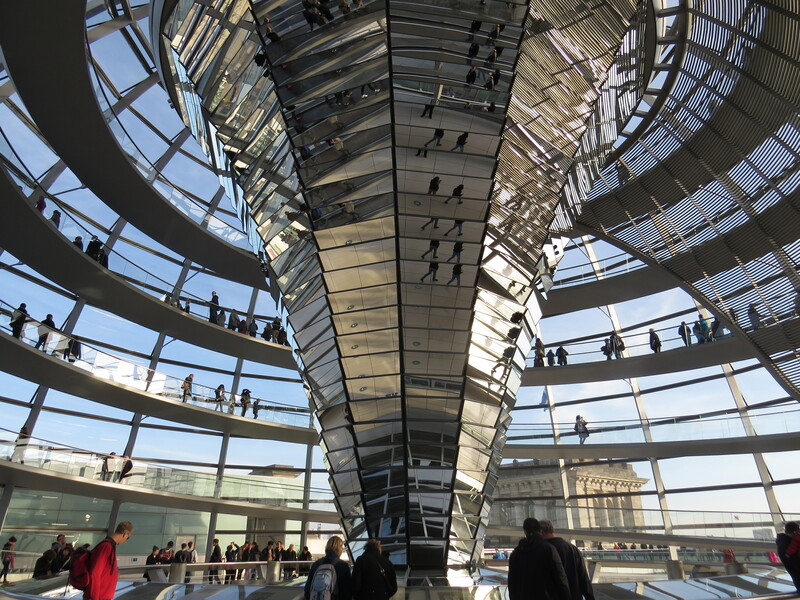 Despite being Germany’s biggest city and capital, Berlin, to me, evokes a kind of tough, scrappy, brutish image, both from its past as a divided city during the Cold War and its contemporary image as a inexpensive, start-up paradise. I found this to kind of true when I visited it, as it was old in some parts, but I also found it attractive and more modern than Rome or Paris. 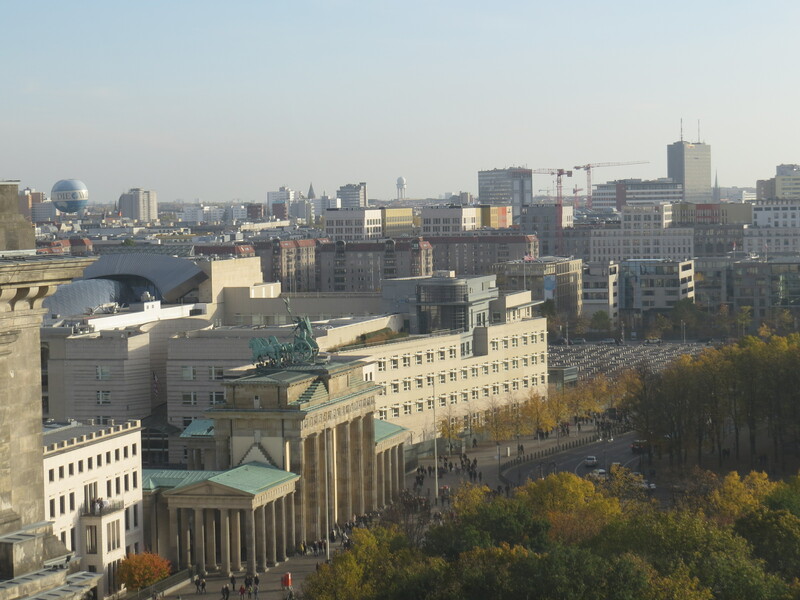 As with London and Paris, Berlin was my first-ever stop in its country. After getting off my budget flight from Rome, I took the airport bus to the station near my “pension,” their word for a cheap kind of inn, which in this case was a set of rooms inside a low-rise apartment. The building was dark at night, had no elevator, and had graffiti painted on the walls of its driveway. Not exactly the most ideal place to stay in. But it was close to the subway, being between two stations, and further up the street, a supermarket with a separate alcohol store next door (perhaps due to local rules). On one of the nights I went there, a group of punks (mohawks, black jackets and all) were hanging out with a couple of pitbulls in the parking lot, which did give me a little bit of trepidation but nothing happened. But yet, the neighborhood was attractive, with a wide expanse of lawn and a neat row of trees separating the block buildings from the sidewalk and main road. It was only the next day I realized there was a distinctive tower with a dome (TV Tower) at the far end of the main road. The neighborhood also had a lot of small businesses like cheap eateries, alcohol stores and clothes stores. 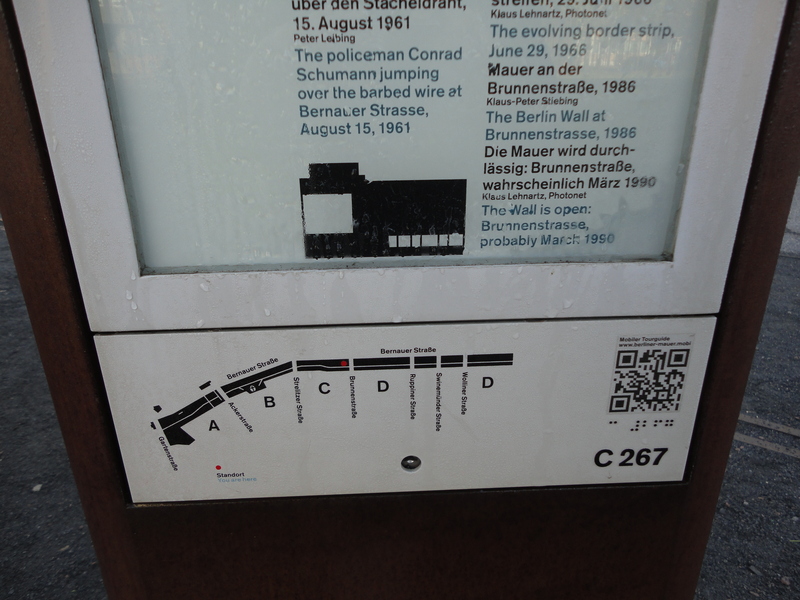 The first place I visited was the Berlin Wall Memorial. 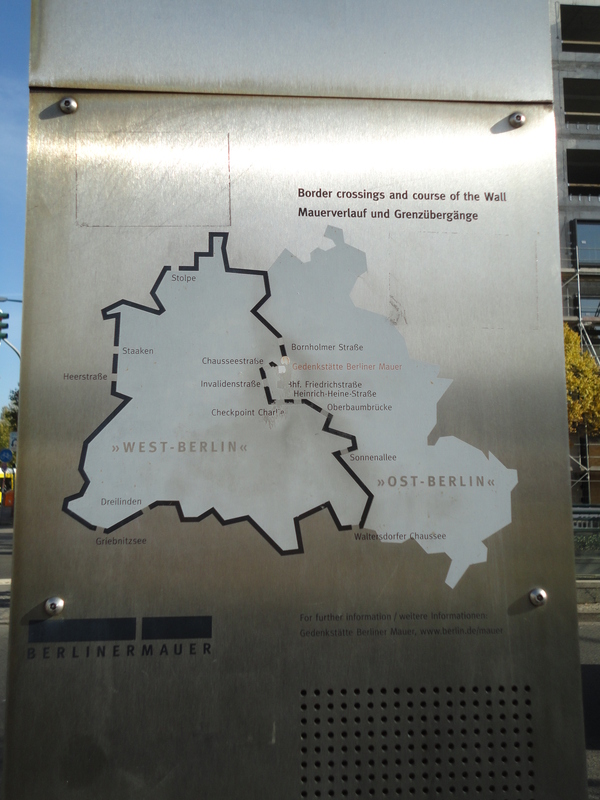 The city’s most famous attraction, the Wall exists as a few preserved sections, as it was mostly torn down. 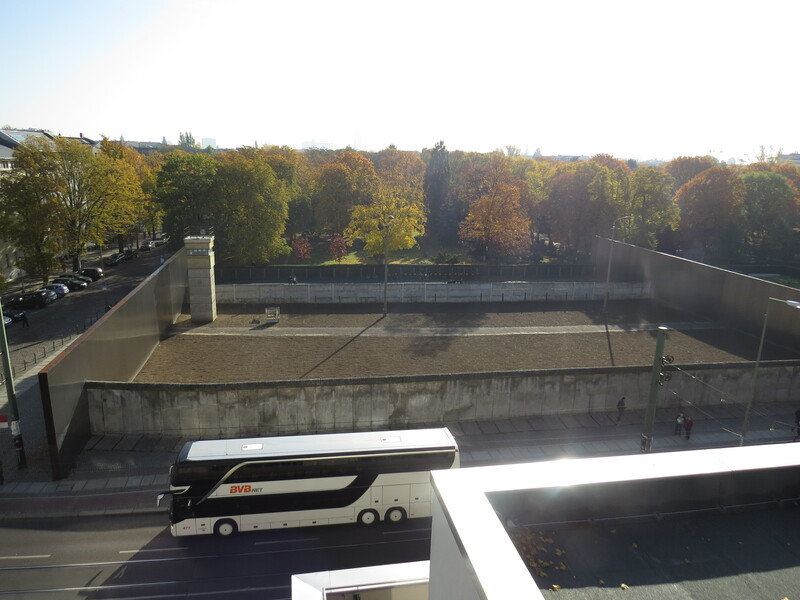 The Memorial is right in the midst of a neighborhood built over where the wall stood. As such, the Memorial stretches along several blocks where parks, preserved wall sections with a watchtower, and a small oval church commemorate the wall. 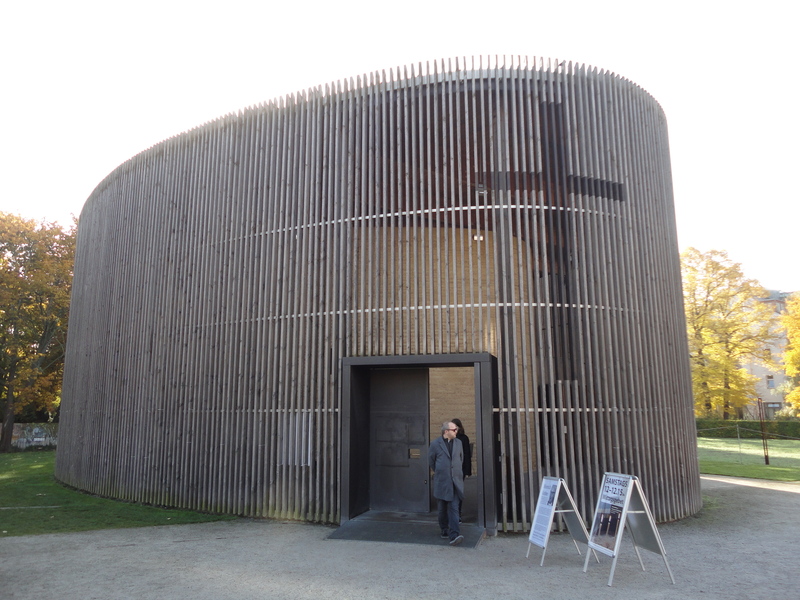 Near the end, there is a museum from which you could get a good view of the wall from the top. 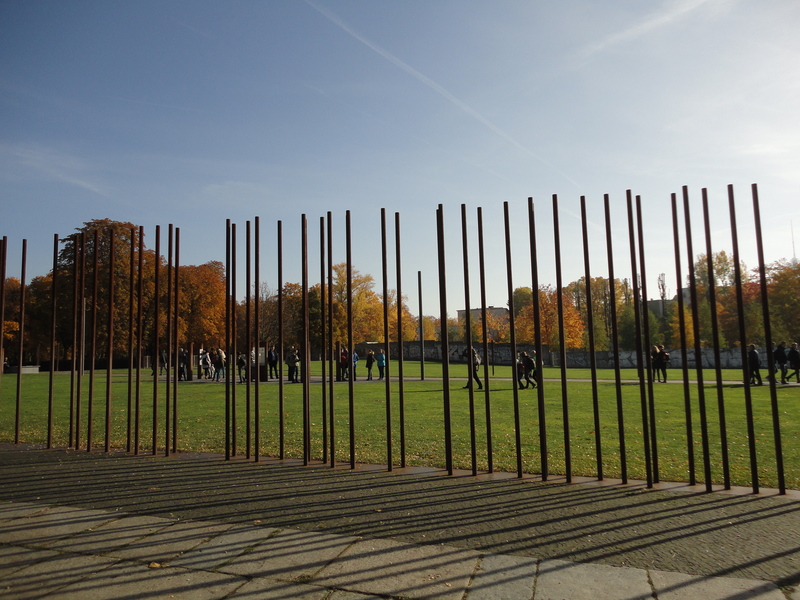 The setting was so serene, in stark contrast to the harsh reality of the wall which bisected Berlin into an open Western part and the Eastern, Communist section from where people tried to flee to the West. Some of them lost their lives doing so, which is also commemorated. 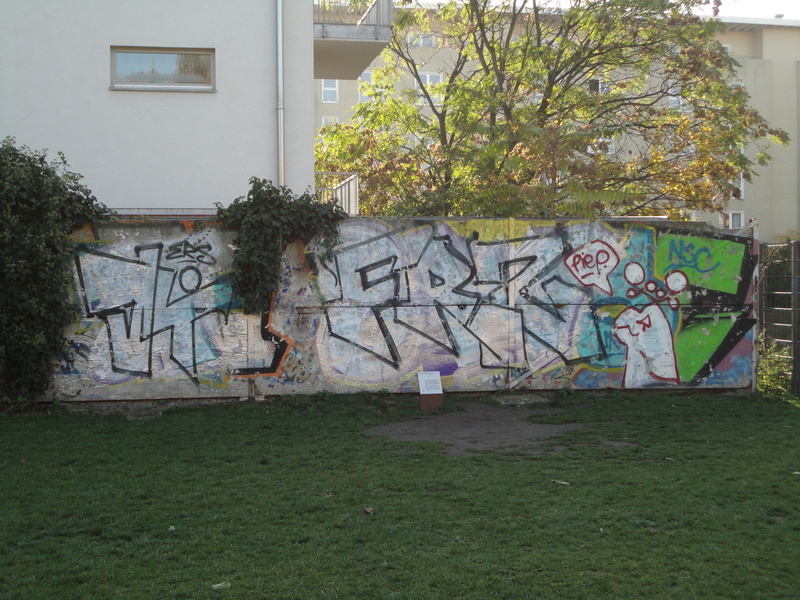 I also visited another more artistic part of the Wall two days later. 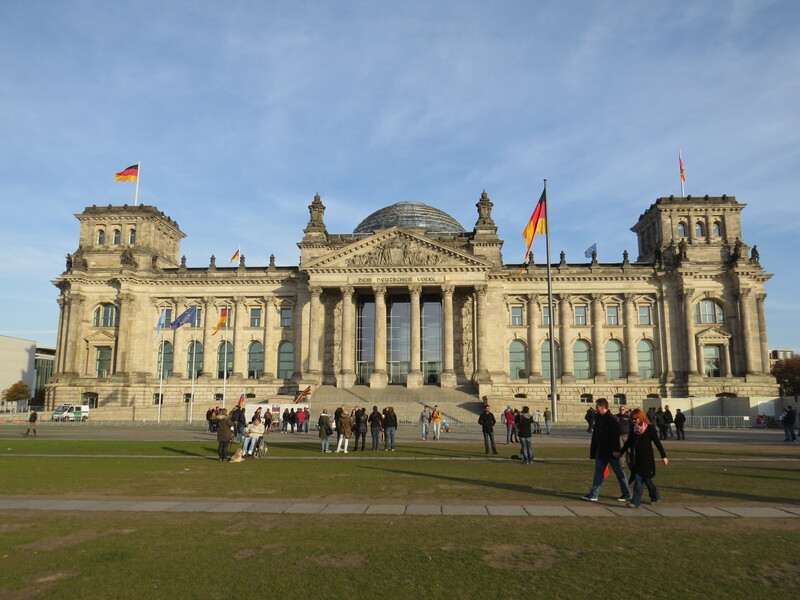 I later made my way to the Reichstag, the nation’s parliament that was in a grand, gray building. 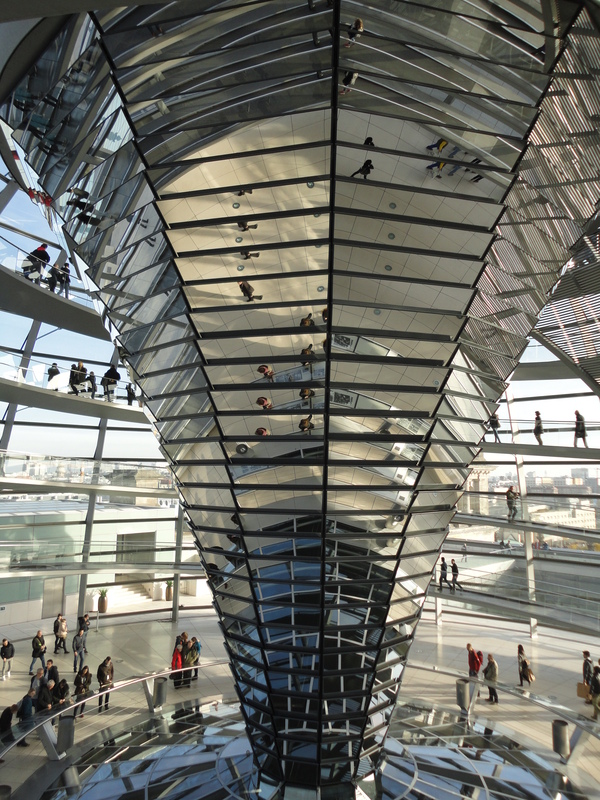 More specifically, I went to the top of the building, a dome from where you could get good views of the surroundings. 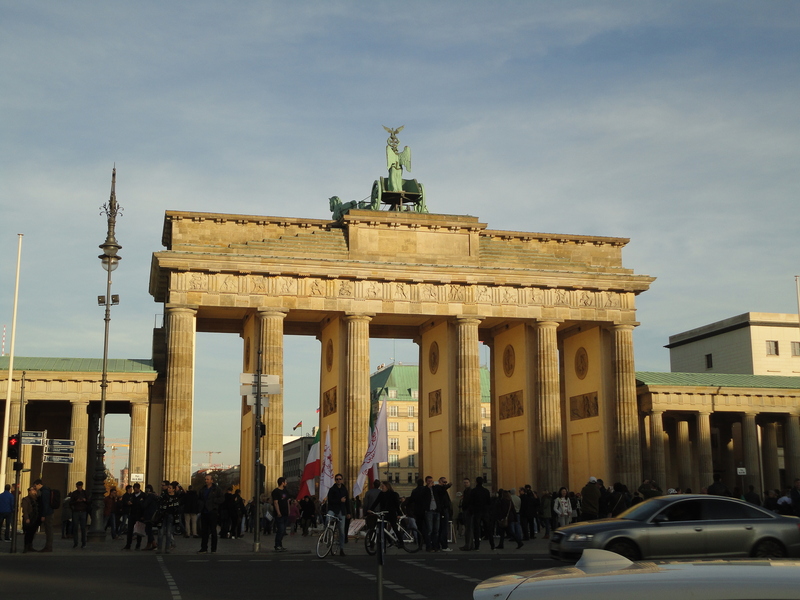 It was then a short walk to the Brandenburg Gate, which was smaller than I’d imagined. 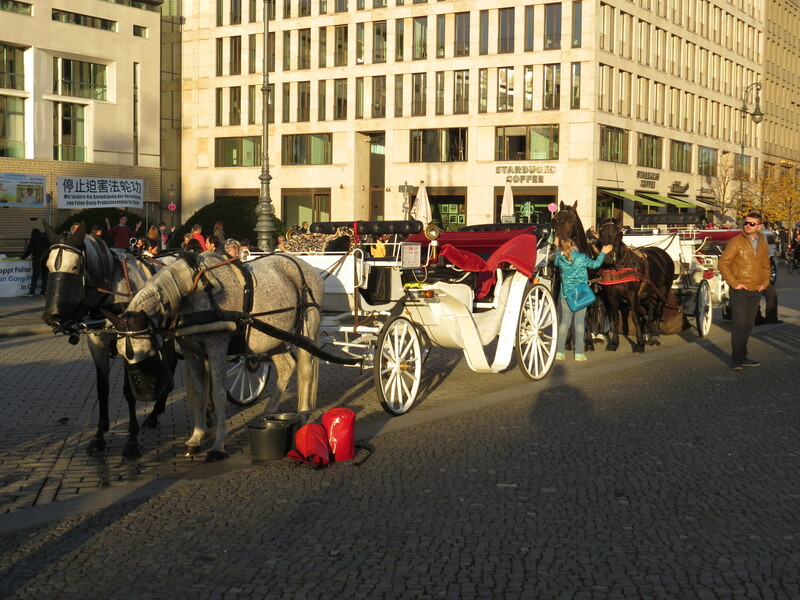 There were horse carts, street musicians, and even an Iranian protest against their country’s regime going on. 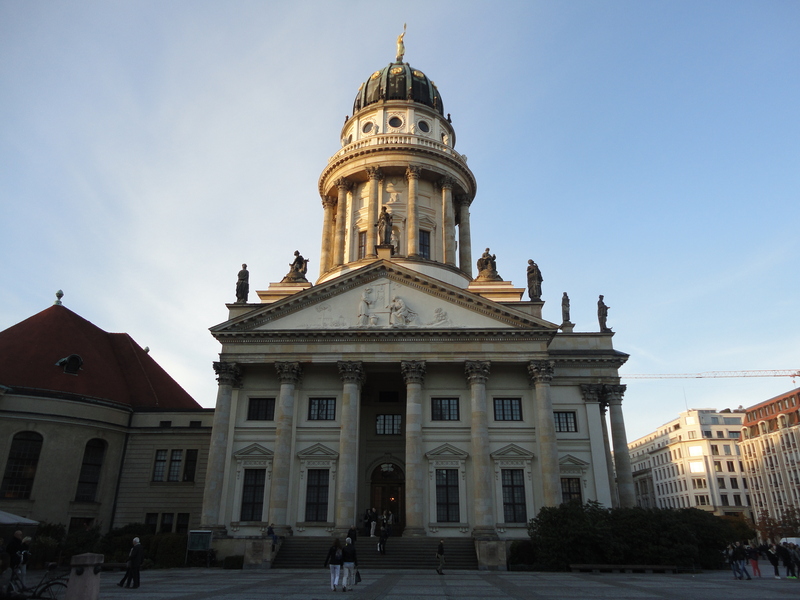 I walked to Gendarmenmarkt, where three magnificent buildings – the 18th century Konzerthaus Berlin (Concert Hall) and two 17th century churches (the French and German churches) are lined up in a row. 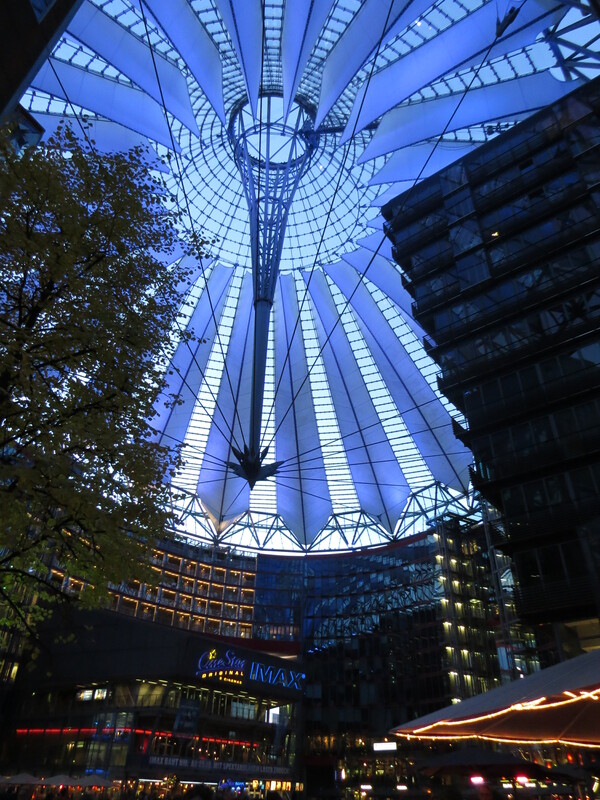 I finished off the day by going to Potsdamer Platz, a confusing mall complex spread across several buildings and basements. The coolest part was Sony Plaza, a circular entertainment building covered by a neon-coloured roof made up of blades that resembled a propeller. The subway was old, but retro and clean in a charming way, not so much creaky and antique like Paris’, cramped like London’s or dark and dirty like Rome’s. 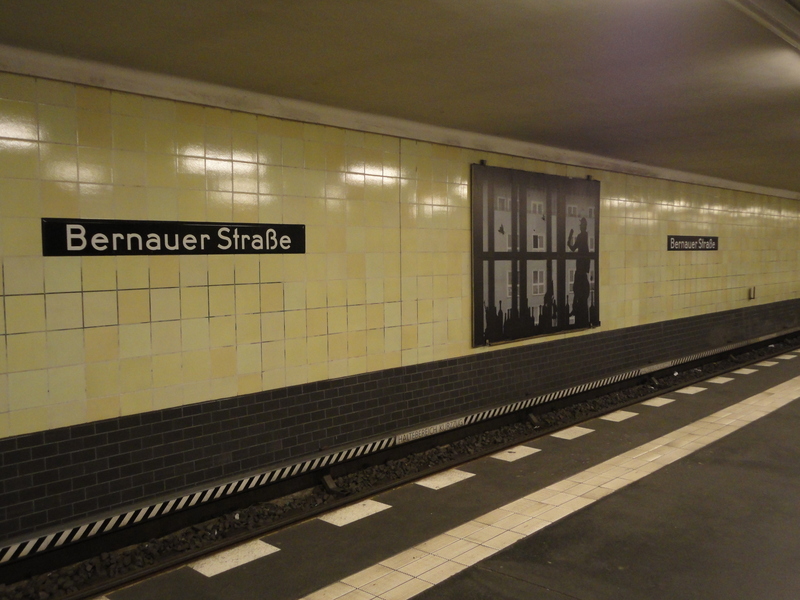 But it was a little confusing (see the system map) because there are so many lines, divided into surface and underground trains- U-Bahn and S-Bahn.